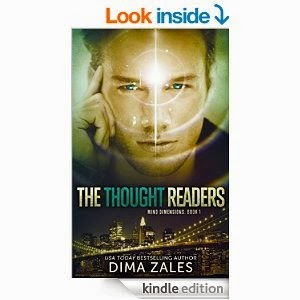 The Thought Readers (Mind Dimensions Book 1) by Dima Zales & Anna Zaires. It was more by chance than anything that I stumbled upon this book, but I'm thankful that I did. This is an urban fantasy novel based upon mind readers, but they also have another power that allows them to detach themselves from time. Think the first Matrix film in the scene at the end when Neo stopped time and dropped those bullets. Darren is the main character, who is a reader. He's 21, graduated from Havard at 18 and is now working for a hedge fund company - all thanks to his powers. And so he's basically living the dream. He thinks he's the only one that can do the things he can but while gambling/cheating at a casino he comes across a beautiful girl who lo-and-behold also had the same powers. The story then shifts direction as he tries to learn more about his talents. And along the way there's some baddies that want to do harm to his new crush. I felt like I found something special when I read the book's blurb and the effusive reviews. You know sometimes when you come across a book that you just take one glance at it and you know it's going to be good. Well, I bought the book at 10am and finished it at 5pm. So that gives you some inkling at how much I enjoyed the story (and no the book wasn't ten pages long). The writing was superb. The sentences were witty, sharp and constantly kept the story ticking. The pace of the story was frantic, but good frantic. Character wise - due to it being in 1st person - you only really get to connect with Darren. He's a well done character, who's not omnipotent but not terribly weak. Rather, he's believable - he's does what you'd expect to do if you were in his position. The only negatives I can give the book is that it felt too short despite its 300 page print length. It felt a look shorter than that. Another negative was that it delved a little too deeply into the technical side of things, with a lot of scientific ideas thrown in. I don't mind that, if I'm in the mood for it, which is basically never. But I really am being finicky here. Fantastic book that I recommend to everyone that loves urban fantasy. Interesting ideas blended with an exciting story and a likeable protagonist makes this a special book. And whilst writing this review I've already bought the sequel.